A tooth with an abscess can lead to a lot of pain. An abscess means there's an infection inside the tooth's root. You'll have visible swelling and, obviously, plenty of pain, which could make it tough to use the side of your mouth with the abscess. In addition, when you've got a fever, the disease has spread to your jaw and might become an infection in your entire body. To deal with the abscess, your dentist will have to remove the infection and also prescribe antibiotics. Dental cavities are a usual suspect in regards to toothaches. While you might think of a cavity as a routine problem, they could become bigger issue, such as an abscessed tooth, if you don't take care of it. If found early, a cavity is easily cleaned and sealed with a tooth-colored filling or other restoration. Your temporomandibular joint (TMJ) is the hinge that allows your jaw to open and close. 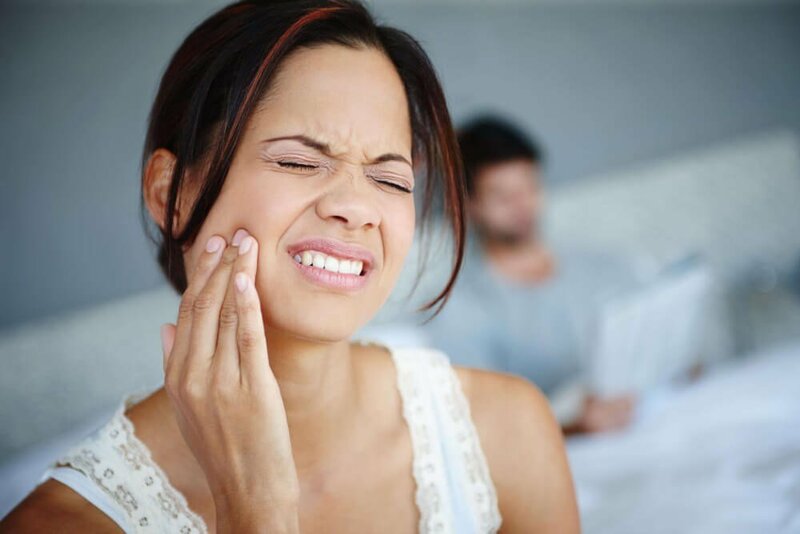 If you clench your jaw, whether you do it as a reaction to anxiety throughout the day or during the night when you're asleep, it can result in TMD (temporomandibular joint disorder). This can change your bite alignment causing head and toothaches, as well as other problems. DentalWorks in Canton, MI provides many therapies for TMJ disorder, for example, night guards. As soon as your TMD is identified, your dentist will create a custom TMJ treatment plan. There are many different ways people respond to pressure. If you're grinding your teeth through the day, then you will eventually develop toothaches. You could also have nocturnal or nighttime bruxism, meaning that you're grinding your teeth while you sleep. Chronic grinding hurts your oral health, resulting in weakened enamel, pain, and dental cracks. After assessing your teeth grinding, your dentist will create a custom treatment plan to first stop the damage created by grinding then restore the strength and health of your teeth. Lots of people have old silver fillings that do not adhere very well to teeth compared to contemporary fillings. A loose restoration can actually cause other issues quickly. Debris and germs creep into the cracks beneath your filling creating inflammation, decay, and infection. Remember that you don't necessarily need to see or feel that a filling is loose. The motion of your restoration could be very small. You might not realize you've got an issue before your dentist finds it using a digital x-ray. In case you have amalgam fillings, speak with your dentist and have them replaced with tooth-colored fillings before you've got tooth pain. When you are straightening your smile using metal braces or transparent aligners, then you will most likely feel some pain in your teeth. When braces are tightened, there's typically a day or two when your gums and teeth are very likely to be somewhat raw. Changing to the next pair of aligners also will cause tooth pain for a few days as your teeth and gums get used to the new trays. We recommend that you speak with your orthodontist or dentist about suggestions to decrease distress with non-prescription pain medication and other home remedies. Intense pain or concerns that last longer than a few days need to be reported right away because it may be an indication of a significant issue. Once you've had a sinus infection or severe seasonal allergies, you understand the distress of sinus headaches from pressure. Your teeth (especially you top molars) are extremely near your sinus cavities so you might feel toothaches when you have sinusitis (an infection in your sinuses). You'll have to visit your doctor to treat the infection. As soon as you have your sinus infection managed, your dental and facial pain should ease up for much-needed relief. Store-bought teeth whitening products, like whitening strips, can cause sensitivity. Over-bleaching and getting products into a cracked tooth may be reasons your teeth hurt. Instead of risking toothaches, sensitivity, and also bad outcomes, schedule an appointment to get more information on professional whitening. Our office in Canton, MI provides both in-office and home professional whitening options personalized to suit your goals and special needs. Occasionally, that you might feel a place in your smile that delivers a jolt of pain if you sip a hot beverage or eat something ice cold. Tooth sensitivity to cold, hot, or sweet may be a sign of a bigger dental issue, for example an exposed nerve or cavity. You need to make a consultation at the dentist if the sensitivity is severe or lasts a long time so that the problem can be identified then repaired. Hopefully, you won't ever experience this, but if you're in an auto crash or suffer an accident while playing sports, the trauma to your teeth may lead to a fracture, crack, chip, or even the loss of a tooth. It's a good idea to get your teeth checked during your next dental appointment if you experience a trauma to your mouth and lower face. To protect yourself from dental injuries during sports, Dental Works in Canton, MI makes custom mouth guard specially designed for athletes. The wisdom teeth, or third set of molars, usually come in once your other teeth have already filled up your smile. When the new molars begin to come in (commonly around the late teens and early 20s), you likely do not have space in your smile. That is the reason these teeth are often extracted. Though when they first appear, wisdom teeth may give you trouble. You might notice something as small as an overall ache to a serious pain that won't go away. Your lower face may be inflamed and feel tender during the eruption process. With advanced extraction methods along with sedation, extracting wisdom teeth is a simple procedure, which keeps you from far more trouble. Keeping your wisdom teeth increases the chance of nerve damage, cysts, along with a much more invasive extraction procedure. Whenever you are feeling even a little pain, you need to schedule an exam at your dentist to have the issue identified and treated. If you are ignoring the pain due to dental worries or anxiety about the prospect of a lengthy process, ask about your sedation choices. DentalWorks in Canton, MI utilizes innovative technology and methods to keep patients comfortable during your appointment; however, we also provide several different types of sedation. And bear in mind that many issues won't heal naturally, so if you wait, the the issue will probably get worse, which might lead to a more invasive treatment. If you want to avoid wasting money and time in your dentist's chair, schedule appointment twice a year at DentalWorks in Canton, MI to get a professional cleaning also an examination. This gives your dental team the chance to recommend proactive treatments such as fluoride treatments, sealants, and much more that will lessen your chance of developing oral health conditions. Benjamin Franklin's advice, "an ounce of prevention is worth a pound of cure," is as true today as it was in the 1700s, especially when it comes to avoiding toothaches and dental problems.